uilt for Windows Servers, NovaBACKUP Business Essentials protects critical business files, business application and virtual machines. Supports the latest Windows server technology up to Microsoft SQL 2014 and Exchange 2013, and supports up to VMware ESXi / vSphere 5.5 licensed with the vStorage API, and Hyper-V on Windows Server 2012 R2/2012/2008 R2. Securely protects files, databases, emails, shared images, shared media files, documents and all system information from a single solution. Get full, incremental, and differential backups, plus Disaster Recovery image backups for complete system restores, even to dissimilar hardware. With best-in-class granular mailbox restore for Microsoft Exchange, you can recover entire mailboxes or individual emails. Get daily, weekly or monthly backup summary reports sent via email with simple one-step email setup. Backup your data to hard drives, thumb drives, NAS devices, FTP, tape libraries, RDX drives, online, or to file sharing sites like Dropbox or OneDrive. With patented file restoration technology, you can find and restore any file, including historical versions of files, regardless or when of where the files were backed up. 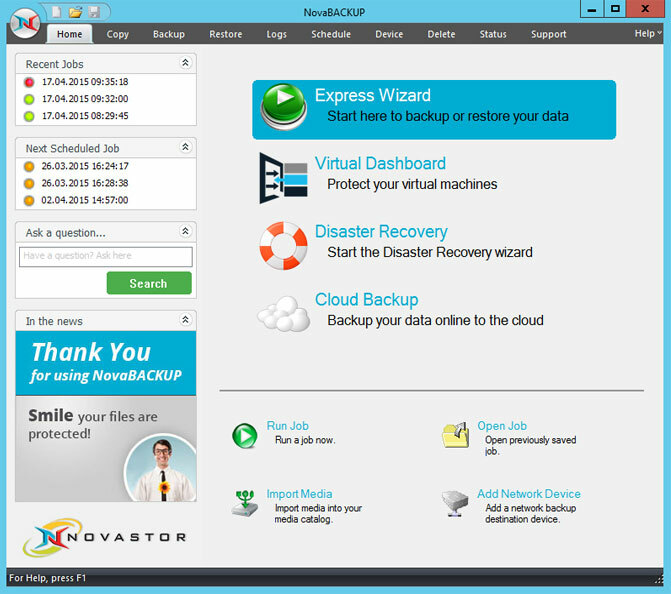 NovaBACKUP remembers which storage device you stored a file, so you can quickly find and restore the file or files you need. Simplifies virtual backup management, monitoring and control of all Hyper-V and VMware VMs using a single dashboard. Offers Hyper-V or VMware VM replication with changed block tracking. In the event of a disaster, you can move your VM into production within minutes, significantly reducing downtime. You can also restore a single file from your virtual machine, rather than restoring the entire machine. With rock-solid stability, all-inclusive pricing, award-winning backup technology, 256-bit encryption, industry-leading technical support, custom installations and setup assistance, NovaBACKUP is the right choice for your business. NovaBACKUP is backup for the rest of us. Pentium 4 or better, 1 GB of RAM minimum, 3 GB HDD on OS drive.